Beautifully remodeled two bedroom two bath ground floor condo that opens up to the expansive lawn and to the bluff that overlooks the ocean. No steps and no stairs to climb. Private and quiet location. 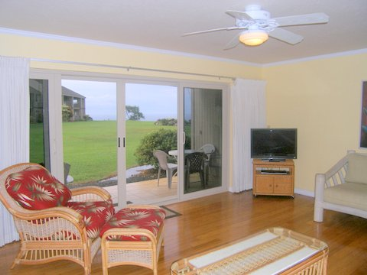 The living room, dining room, kitchen and master bedroom all offer ocean views. Bamboo flooring in the main living area and master bedroom. Updated kitchen with slab granite countertops, cabinets and appliances. Updated Bathrooms. Solid core doors.